Do you want to make a difference in the life of a deaf person, particularly a child, in a developing country? Whether you wish to volunteer or give monetary donations, the options are many. What follows is a sample of these options. Partners for a Greater Voice supports oral education in developing countries. At the time this article was written, they were working primarily in the Dominican Republic and India. Greater Voice provides training to future teachers of the deaf, starts, provides hearing aids to needy families, and supports schools. Publishing El Oído, a Spanish-language magazine on hearing loss (depends on sponsorship). This publication is archived online. Partners for a Greater Voice offers volunteer opportunities for teachers of the deaf, and audiologists. GDC is a young organization, but already their work is making a huge difference in Africa, where their goal is to have at least one deaf teacher of the deaf in each deaf school. The case studies on their site describe the past, present, and expectations for the future. Usually, the "past" means very few deaf teachers of the deaf, and the present means a substantial increase. There are even nongovernmental organizations that focus on one country. One such organization is Deaf Africa Association, which focuses on Ethiopia. The organization provides educational assistance for deaf children in Ethiopia. It was launched by a family moved by the poverty they saw in a deaf school in Ethiopia. Quota International is a large nonprofit with a long history of helping deaf people. Quota began helping deaf people as far back as 1946. Although the headquarters is in the United States, Quota has clubs around the world. Quota has a charitable arm, the We Share Foundation, that provides educational support in developing countries. We Share Foundation has a Club to Club program that has local Quota clubs run community projects. Quota International of Iloilo, Philippines supported the Leganes Resource Center for the Deaf, which they started to provide free education to deaf children. Quota International of Las Piñas, Philippines is teaching deaf children there. Quota International of Legazpi-Mayon, Philippines is training deaf women in sewing skills. The UK-based International Deaf Children's Society has regional programs. At the time this article was written, the only regional program was in India. The IDCS-India program has already accomplished things such as the publication of Lakshana, a newsletter for parents of deaf children. IDCS also has a small grant program that supports local organizations working with deaf children in developing countries. The program has supported and continues to support a wide variety of projects all over the world. Typical projects supported were things such as learning sign language, parents' associations, vocational training, and deaf clubs. Almost 30 different countries were found through the database of projects. In addition, IDCS provides information on additional nongovernmental organizations (primarily UK-based) and volunteer opportunities through another database on the site. Sound Seekers is another UK-based organization trying to make a difference for deaf children. One of their key accomplishments is in bringing audiological services directly to deaf children in hard-to-reach places. This is done through HARK!, a mobile ear clinic. (Pictures of the Hark! can be seen throughout their website) Another accomplishment is the offering of "audiology maintenance technology," training people to fit hearing aids and make earmolds. Also UK-based, Sense International aids deafblind people by working through partnerships. VSO offers volunteer opportunities for teachers of the deaf as well as teachers of the blind. Examples of volunteer opportunities, such as Teacher of the Deaf - Nigeria, are posted online. Searching the VSO site on the "deaf" keyword turns up stories of volunteers' experiences in addition to information on deaf-related VSO projects. One of the primary sources of help for deaf people in developing countries is the United States government, through the U.S. Agency for International Development (USAID). USAID's primary program for assisting deaf people in developing countries seems to be the Cooperative Association of States for Scholarships Program (CASS). CASS provides scholarships to foreign deaf students as well as students with other disabilities, and to hearing students studying to become sign language interpreters. CASS is administered by the Georgetown University's Center for Intercultural Education and Development (CIED). It is apparently a very successful program because according to USAID "over 95%" of deaf CASS graduates get jobs in their home countries. CASS recipients tend to be from the Caribbean, Central America, and Mexico. Some foundations have programs to aid deaf students from other countries. One well-known foundation is the Nippon Foundation. This foundation supports deaf international students at both Gallaudet University and the National Technical Institute for the Deaf. For example, at Gallaudet, the Nippon Foundation sponsors the Sasakawa International Scholarship. Another scholarship program at Gallaudet is the World Deaf Leadership Scholarship, which aids deaf students with the expectation that they will return to their countries to become leaders of the deaf community there. A similar scholarship, Ryoichi Sasakawa Scholarship, is sponsored at NTID. 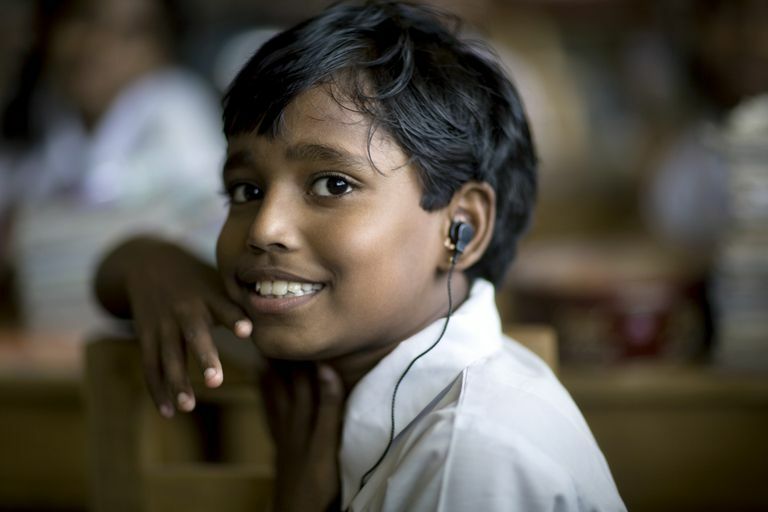 Are Things Improving for Deaf People in India?